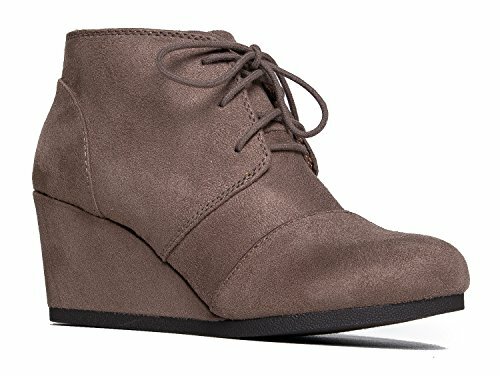 Looking for vegan desert boots that go with a wide variety of outfits? We've rounded up 10 options (for both women and men) that are both stylish and of course -- cruelty free. Be sure to check out #5. I've never see anything quite like it! 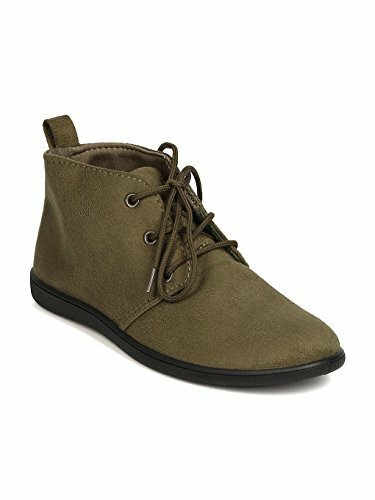 Women's khaki desert boot in soft faux suede with matching khaki shoelace. Has a pull tab on the back so you can steady the boot while putting it on. Constructed with a black no-skid sole. Insole and footbed are padded to keep your foot comfy. 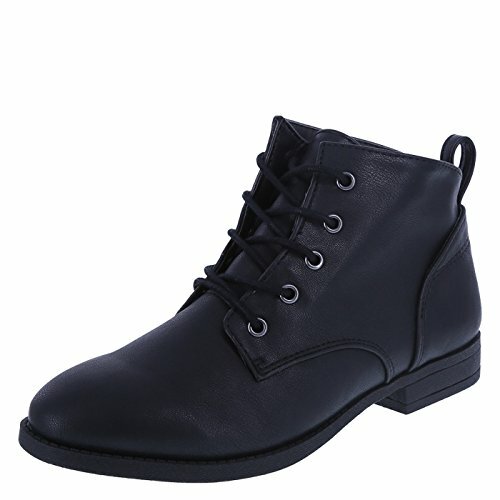 Pros: Very inexpensive and cute boots to wear to the office or for a walk in the city. Match these boots with corduroy for high fashion appeal. Cons: Narrow in the toes and not waterproofed. Some reviewers have reported that they crease quickly. 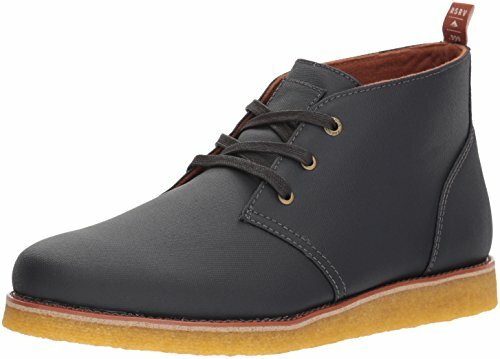 Men's classic desert boot in navy blue. Sometimes you just cant beat the classics. Minimal lace-up design with a blue bootlace. Has a faux crepe outsole that mimics a traditional desert boot sole. Light inner padding and lining for decent cushion. Advertised as vegan: Yes. The product description shows "vegan, animal-friendly faux suede" material. Pros: Beautiful boots that can be worn for business or leisure, and at such a reasonable price. Paired with nice slacks, these vegan blue suede shoes will make you feel the King himself. Cons: No mention of warmth or water resistance. Probably not meant for vigorous wear and tear. 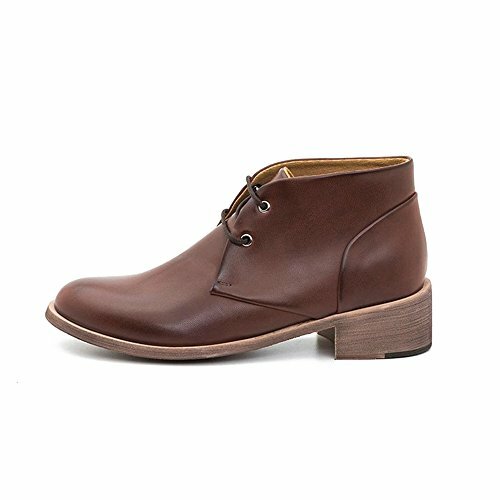 Women's dark brown, almond toe desert boot that looks like it's made of real leather (but isn't). Skid-free sole adds extra safety. Has a cotton-covered biolatex insole for breathability. The low stacked heel will give you just a little extra height. Advertised as vegan: Yes. Ahimsa is a vegan footwear brand. Pros: Durable construction with a gorgeous, polished appearance. Whatever you wear these with will instantly look classier. You can swap out your oxfords for them, too. If the look of genuine leather is important to you, these might be your boots. Cons: The price, but customers find Ahimsa shoes to be well-made, so they shouldn't need quick replacing. 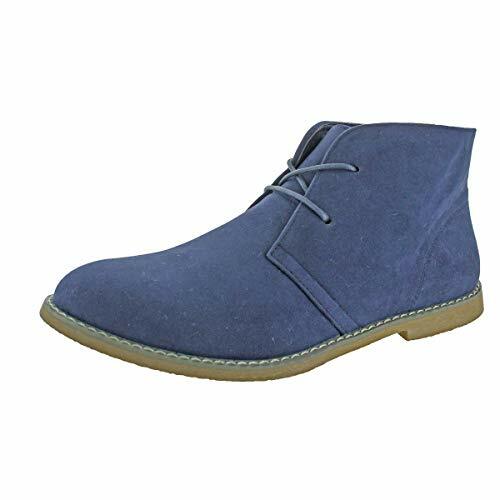 Men's slate blue canvas desert boot that ingeniously combines a fashion boot with a skate shoe. Has a bouncy rubber sole to cushion your step. Made with a crepe outsole in the style of the desert boot. Lace-up design for a snug fit. Canvas is PU-coated to provide water resistance. Advertised as vegan: Yes — the product description says "vegan friendly." Pros: Should be durable and athletic with good flexibility. Great if you're looking for stylish boots that will accommodate an active lifestyle. Soft, comfortable and practical for outdoor use. No need to worry if you get caught in the rain with these on. Cons: Fairly costly and perhaps on the small side. Women's lipstick red desert-style lace-up wedge. Va-va-voom. The 3.25" wedge heel is wrapped in red faux suede to match the rest of the boot. Has a rubber outsole to protect your foot from slippage. Insole is padded for comfortable wear. Advertised as vegan: No, but the vendor describes these boots as synthetic. Pros: The shoes for when you want to ditch the stilettos but feel like a siren. Go for frayed high water jeans for a mod daytime look. Comfort and fashion for a super low price — they're a steal. Plus, the vegan suede stretches a bit so you don't have to worry about narrowness. Cons: Not built to last through the years. 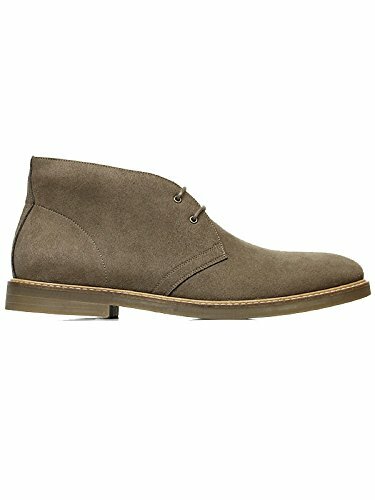 Men's vegan micro suede desert boot with matching taupe bootlace and sole. The vegan suede is breathable and water-resistant. Lined with breathable fabric and hand-stitched inner padding. Sole is durable for long-lasting wear. Made in Portugal with an ethical design. Advertised as vegan: Yes. Will's Vegan Shoes is a vegan company. Pros: Elegant minimalism that suits business meetings and date nights. The waterproofing and solid construction should make these boots last a lifetime. Cons: Expensive and not available in half sizes. Women's black faux leather desert boot that settles somewhere between a combat boot and a dress shoe. All black design complete with black bootlace and sole. Pull tab on the back lets you slip the boot on with ease. Low heel and padded footbed for added comfort. Advertised as vegan: No. The materials listed are all man-made. Pros: Not so dressy that you'd call them special occasion shoes, but not so casual that you can't wear them to work. A balanced aesthetic that will suit a good variety of clothing styles. Can be worn with a dress or with pants. Cons: Sole is a bit thin and lacking traction — not a good slip-resistant or all-weather boot. 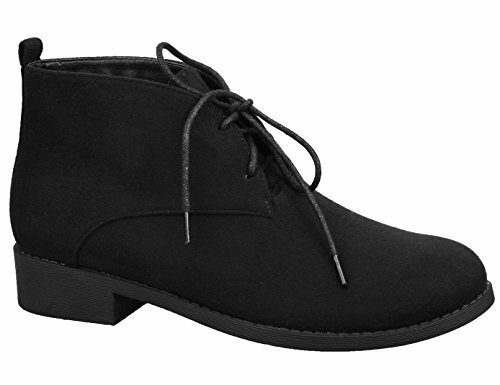 Men's soft faux suede desert boot in black from bootlace to heel. Has a pull tab for easy on/off wear. Features a textured, crepe-like tread. Easily cleaned with a damp piece of cloth. Advertised as vegan: No, but the product title and description say "faux suede." Pros: Great boots to wear to a function. The black color and matte material will go with any dressy pants you throw at them. Cons: Limited sizes (including no half sizes) available. No mention of water resistance, so don't they're probably not multi-season footwear. Women's navy faux suede ankle boot in the desert style with a vintage vibe. The crepe block heel is low in height for long and comfortable wear. Pull tab at the back makes the boot a cinch to get into. Blue lacing can be tightened to give you a closer fit. Advertised as vegan: No, but these boots are faux suede. Pros: Expensive taste for little money. The old-fashioned style has versatile appeal and goes well with dresses. They'd also go brilliantly with classic buffalo plaid. Cons: Somewhat roomy — the European sizing system may not be perfectly translatable. Most likely not meant for multiple terrains or seasons (no waterproofing to speak of). Men's textured faux leather desert boot in dark tan. Fastens with a brown bootlace. Switches it up a little with a contrasting white sole. Makes for easy cleaning with a damp cloth. Advertised as vegan: Not as such, but they're faux leather boots. Pros: Dapper boots you really could wear anywhere. No one would know they were so inexpensive. Rockable in most seasons with skinny jeans, a suit and tie, a t-shirt or flannel. Cons: Probably not very warm or waterproof, so take that into consideration for wetter, colder climates and seasons.